The Ely Mine, which operated from 1821 to 1905, and its area of downstream impact constitute the Ely Copper Mine Superfund site. The site was placed on the National Priorities List in 2001. The mine comprises underground workings, foundations from historical structures, several waste-rock piles, roast beds associated with the smelting operation, and slag piles resulting from the smelting. The mine site is drained by Ely Brook, which includes several tributaries, one of which drains a series of six ponds. Ely Brook empties into Schoolhouse Brook, which flows 3.3 kilometers and joins the Ompompanoosuc River. The aquatic ecosystem at the site was assessed using a variety of approaches that investigated surface-water quality, sediment quality, and various ecological indicators of stream-ecosystem health. The degradation of surface-water quality is dominated by copper with localized effects caused by iron, aluminum, cadmium, and zinc. 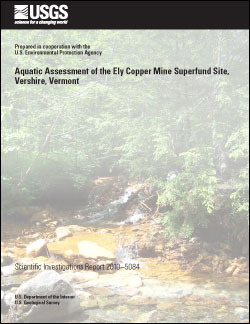 Chronic water-quality criteria for copper are exceeded in the surface water of four of the six ponds on the Ely Brook tributary, and all of Ely Brook and Schoolhouse Brook, and of the Ompompanoosuc River downstream of the confluence with Schoolhouse Brook. Comparison of hardness-based and Biotic Ligand Model-based water-quality criteria for copper yields similar results with respect to extent of impairment. However, the Biotic Ligand Model criteria are mostly lower than the hardness-based criteria and thus suggest a greater degree of impairment, particularly in the Ely Brook watershed, where dissolved organic carbon concentrations and pH values are lower. Surface-water toxicity testing correlates strongly with the extent of impact. Likewise, riffle-habitat benthic invertebrate richness and abundance data support these results through the stream environment. Similarly, the index of biotic integrity for the fish community in Schoolhouse Brook and the Ompompanoosuc River document degraded habitats throughout Schoolhouse Brook from Ely Brook down to the Ompompanoosuc River. The sediment environment shows similar extents of impairment also dominated by copper, although localized degradation due to chromium, nickel, lead, and zinc was documented on the basis of probable effects concentrations. In contrast, equilibrium-partitioning sediment benchmarks indicate no toxic effects would be expected in sediments at the reference sites, and uncertain toxic effects throughout Ely Brook and Schoolhouse Brook, except for the reference sites and site EB-600M. The results for site EB-600M indicate predicted toxic effects. Acute toxicity testing of in situ pore waters using Hyalella azteca indicates severe impacts in Ely Brook reaching 100 percent lethality at site EB-90M. Acute toxicity testing of in situ pore waters using Chironomus dilutus shows similar, but not as severe, toxicity. Neither set of in situ pore-water toxicity tests showed significant impairment in Schoolhouse Brook or the Ompompanoosuc River. Chronic sediment toxicity testing using Hyalella azteca indicated significant toxicity in Ely Brook, except at site EB-90M, and in Schoolhouse Brook. The low toxicity of EB-90M may be a reflection of the low lability of copper in that sediment as indicated by a low proportion of extractable copper (1.1 percent). Depositional-targeted habitat invertebrate richness and abundance data support these conclusions for the entire watershed, as do the index of biotic integrity data from the fish community. The information was used to develop an overall assessment of the impact on the aquatic system that appears to be a result of the acid rock drainage at the Ely Mine. More than 700 meters of Ely Brook, including two of the six ponds, were found to be severely impacted, on the basis of water-quality data and biological assessments. The reference location was of good quality based on the water quality and biological assessment. More than 3,125 meters of Schoolhouse Brook are also severely impacted, on the basis of water-quality data and biological assessments. The biological community begins to recover near the confluence with the Ompompanoosuc River. The evidence is less conclusive regarding the Ompompanoosuc River. The sediment data suggest that the sediments could be a source of toxicity in Ely Brook and Schoolhouse Brook. The surface-water assessment is consistent with the outcome of a surface-water toxicity testing program performed by the U.S. Environmental Protection Agency for Ely Brook and Schoolhouse Brook and a surface-water toxicity testing program and in situ amphibian testing program for the ponds. Seal, R.R., II, Kiah, R.G., Piatak, N.M., Besser, J.M., Coles, J.F., Hammarstrom, J.M., Argue, D.M., Levitan, D.M., Deacon, J.R., and Ingersoll, C.G., 2010, Aquatic assessment of the Ely Copper Mine Superfund site, Vershire, Vermont: U.S. Geological Survey Scientific Investigations Report 2010–5084, 131 p.